In nearly every country, the young and the well-educated are especially likely to embrace all of these technologies. People under age 30 and college graduates tend to use their cell phones for more purposes than those in older age groups and those without a college degree, and they are also more likely to use social networking sites. Text messaging is highly prevalent – in 19 of 21 countries, a majority of mobile phone owners regularly send text messages. Texting is most common among cell phone owners in Indonesia (96%), Kenya (89%), and Lebanon (87%), with eight-in-ten or more in Poland, Mexico, Japan and China also saying they regularly text. In Western Europe, seven-in-ten or more say they send text messages on their cell phones, with the notable exception of Germany, where just 56% regularly text. 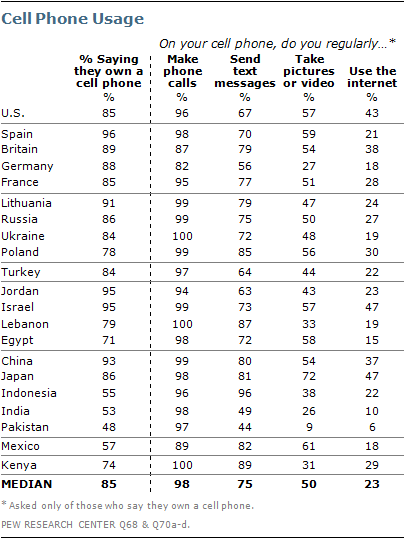 Only in India and Pakistan do less than half (49% and 44%, respectively) of cell phone owners text. The Japanese are the most likely of the publics surveyed to say they regularly take pictures or video with their cell phones, with 72% using their mobile phones for such purposes. Roughly six-in-ten cell phone owners in Mexico (61%), Spain (59%), and Egypt (58%) use their phones for snapping pictures or shooting video, while this is much less common in Lebanon (33%), Kenya (31%), Germany (27%), and India (26%). Only 9% of Pakistani cell phone owners say they use their devices for taking pictures or video. 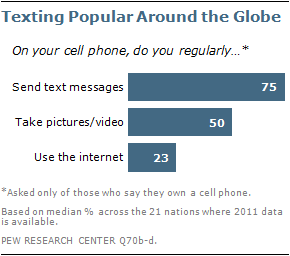 In none of the countries surveyed do a majority use their cell phone regularly to access the internet. Still, at least 30% in six countries – Israel, Japan, the U.S., Britain, China and Poland – do go online using their phone. About four-in-ten of all adults in Britain (43%), Russia (43%), Spain (42%), Lithuania (39%) and Poland (39%) also say they engage in social networking. Among this group, Russia is the only country where nearly all internet users are on social networking sites. Only 6% of Russian internet users say they do not go on these sites. In Germany (35%), France (35%), and China (32%), about a third of adults do so. About three-in-ten are on social networking sites in Ukraine (30%), Turkey (29%), Jordan (29%), and Egypt (28%). In these four countries, as well as many others where social networking is less prevalent, the percentage of users tends to be low because majorities do not use the internet at all; however, among those who do use the internet, more are using social networking sites than not. The percentage of adults who use social networking sites is determined in part by the prevalence of internet use, which is more broadly connected to a country’s wealth. 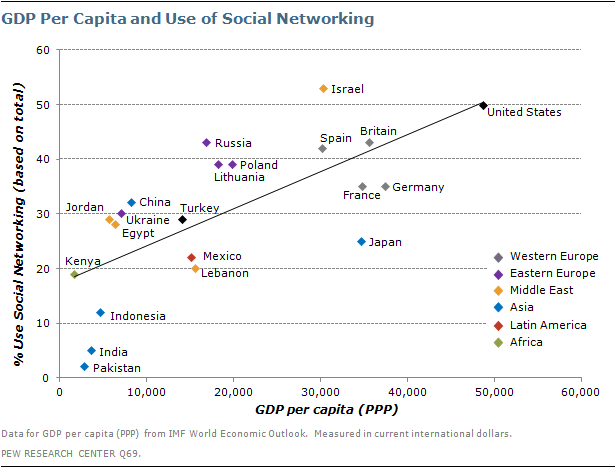 The scatter plot below shows the positive relationship between GDP per capita (PPP) in the country and the level of social networking. The U.S., which has the highest per capita GDP among the countries surveyed, is also among the countries with the highest percentage of adults using social networking sites, while Pakistan and India have two of the lowest per capita GDPs and the lowest levels of social networking. Consistently, young people are more likely to use their cell phones for functions other than phone calls and they are much more likely to become involved in social networking. For instance, in nearly all countries, people ages 18 to 29 are more likely than those 50 or older to access the internet on their mobile phone. This is especially true in Japan, where 78% of mobile phone users ages 18 to 29 regularly use their cell phones to access the internet, compared with only 20% of those 50 or older. Similarly, in the U.S., 73% of 18-29 year-olds use their cell phone for the internet, compared with 49% of 30-49 year-olds and 21% of those 50 or older. Young people are also consistently more likely to use their cell phones for texting and taking pictures or video. 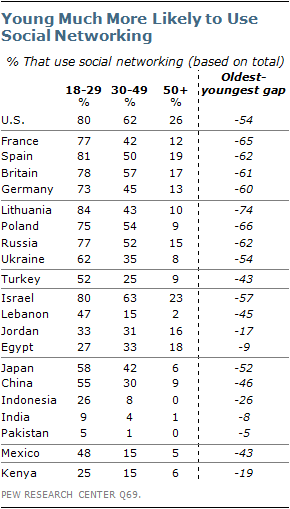 Meanwhile, social networking varies considerably by age in almost all countries surveyed. In 13 of 21 countries, majorities of adults under age 30 use social networking sites. The only country in which even a quarter of those 50 or older engages in social networking is the U.S. (26%). A gap of 50 percentage points or more between adults under age 30 and those over age 50 emerges in 11 of the countries surveyed. The gap is most striking in Lithuania, where 84% of 18-29 year-olds use social networking sites, while 43% of 30-49 year-olds and just 10% of those 50 and older do the same. The gap on use of social networking between the oldest and youngest age groups is also large in the U.S., Western and Eastern Europe, Israel, and Japan. There are smaller gaps between age groups in Indonesia (-26), Kenya (-19), and Jordan (-17), countries with lower internet usage rates. The age gap is smallest in the two countries with the lowest internet usage – India (-8) and Pakistan (-5) – as well as in Egypt (-9). While younger adults are more likely to go online than older adults, the age gap in internet usage is not the sole driver of the age gap in social networking. Even among internet users, older people are consistently much less likely to engage in social networking than adults under the age of 30. There are also notable education gaps regarding the use of these technologies. For example, 76% of Chinese cell phone owners with a college degree use the internet on their device, while just 34% of those who did not complete college use their phones in this way. Among American cell phone owners with a college degree, 53% use their phone to go online, compared with 39% of those without a college degree. Education level is also a significant factor in social networking usage, though the importance of education varies widely by country. The largest differences between college graduates and those without a college degree are found in Egypt (+71) and China (+51). The education gap is somewhat less pronounced in the U.S. and Western Europe; and it is especially low in Germany (+4) and Britain (+2). Compared with age and education, gender differences are less common in these measures of technology usage. Nevertheless, there are notable gender gaps in a few countries, including Spain, where 29% of male cell phone owners use their devices to access the internet, compared with 13% of females. In Germany, 26% of men who own a cell phone regularly use it for accessing the internet, while just 11% of women do so. And in Turkey, the gap is 16 percentage points between men (30%) and women (14%). In Egypt, the gender gap is reversed, with women more likely than men to use their cell phones for texting (80% vs. 65%) and for taking pictures or video (65% vs. 53%). There are few gender differences in social networking usage, although in Turkey 37% of men use social networking sites, compared with just 20% of women.